Nauru is a tiny Pacific Island nation that has the distinction of being the only country in the world that has Australian Rules as its national sport (assuming that status is disputed/shared by several sports in Australia). The capital city is Yaren and the population is just 12,000 but the number of Australian football participants is around 300. The the national team is known as the Nauru Chiefs and they are a team just below the top tier at the International Cup and capable of stepping up with an upset. We think tactically they may have advanced their game and this may be the impetus for them to rise to a higher finish. After finishing IC08 in fourth place, IC11 at sixth and IC14 seventh it might seem like footy in Nauru was going backwards or at least not keeping up. In reality they only lost the one match, against (eventual runner up) Ireland in Bendigo and they were in with a show to win that match until the last quarter. They defeated Indonesia, Great Britain (twice) and the USA. Any potential IC17 opponents would be foolish to take them lightly based on that seventh place finish. 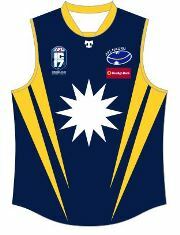 The Nauru domestic competition is made up of six teams that are based on AFL club names and colours. They are the Bulldogs, Magpies, Cats, Bombers, Kangaroos and Hawks. The Magpies defeated the Bombers in the 2017 season spearheaded by Richmond Spanner and Kenneth Oppenheimer. The senior competition is capped at 180 players (30 on each team). This number is set due to the number of volunteers available and all matches are played on one ground. 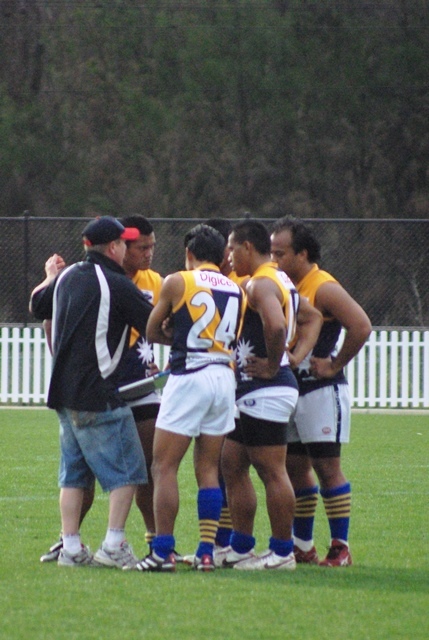 In 2011 most of the Nauru team spent time in Australia playing with country footy clubs to acclimatise in the lead up to IC11. In 2014 it was decided that time spent together in Nauru was more valuable. Adding to this the IC rules this time around restrict the number of players that have been playing in Australia in a squad. The Nauru team did play an All Star team against Zillmere in Queensland and Strathfieldsaye in Bendigo earlier this year to test out their squad in Australian conditions and will have a warm up match in Beenleigh this week against PNG before arriving in Melbourne. This time around the team will be coached by the Premiership coach with the Magpies this year, Zac Temaki . 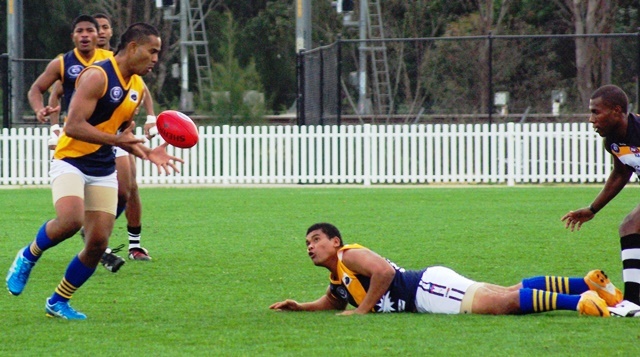 Temaki has twice coached the Nauru stars to victory at the Oceania Cup and as a player played with the Cats in the AFL Nauru competition where he won the 2013 AFL Nauru Best & Fairest winner, and has twice represented the Nauru Chiefs at the International Cup as a player. Nauru is an island nation in Micronesia in the South Pacific. Its nearest neighbour is Banaba Island in Kiribati, 300 kilometres (186 mi) to the east. Nauru is the world's smallest island nation, covering just 21 square kilometres (8.1 sq mi). With just over 9,265 residents, it is the second least-populated country after Vatican City. Settled by Micronesian and Polynesian people, Nauru was annexed and claimed as a colony by the German Empire in the late 19th century. After World War I, Nauru became a League of Nations mandate administered by Australia, New Zealand, and the United Kingdom. Nauru gained its independence in 1968. Nauru is a phosphate rock island, with deposits close to the surface, which allow for simple strip mining operations. This island was a major exporter of phosphate starting in 1907 until the deposits ran out during the 1980s. The island also benefited financially when it was an off-shore detention centre for illegal immigrants into Australia for a period recently. Football was first played by Nauruan schoolchildren in the 1930’s in schools in Victoria, Australia. Among these schoolkids was Hammer DeRoburt. Schools in Geelong and Melbourne in Victoria were popular destinations of Nauruan schoolchildren of secondary-school age. After DeRoburt left Australia, he headed back to Nauru with a couple of friends and popularised the sport in his hometown. Whilst the phosphate mining continued Aussie ex-pats helped to keep the competition alive and prospering. Internationally Nauru first participated in the 1995 Arafura Games in Darwin, Australia. The team, coached by former VFL/AFL player Mark Yeates finished third, winning the Bronze medal. In 2000, the Chiefs travelled to Queensland to compete in the inaugural Web Sports Cup to compete against teams from Samoa and the Robina Roos from Australia. The Chiefs won both matches. In 2001, the Chiefs again travelled to Queensland winning another two matches, one against the Gold Coast Old Boys. In the same year the Chiefs won the gold medal at the 2001 Arafura Games, defeating the Japanese national side. At the AFL International Cup in 2002, the Chiefs finished in 8th place, ranking Nauru the 9th strongest Aussie Rules nation in the world. Nauru withdrew from the 2005 International Cup. 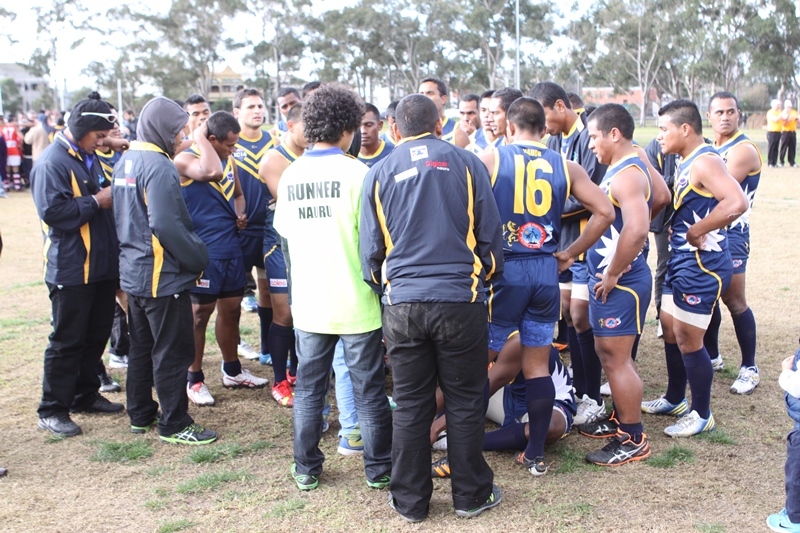 They attended the 2008 event however due to intense rivalry and violence in the National League, the NAFA (Nauru Australian Football Association) placed strict conditions on player eligibility to encourage a sense of unity, meaning that only players under 23 years old with a clean record were able to represent Nauru in the Cup. A number of members of the national team were placed with clubs in country Victoria to spend a few months developing their skills before the tournament. The team performed exceptionally, being beaten once in the opening pool round by the eventual winners Papua New Guinea, their only loss, to place 5th overall. As detailed above their 2011 tournament saw them finish 6th after losing to PNG and South Africa and in 2014 finished 7th losing only to Ireland. In recent years Nauruan youngsters coming through have benefited from the annual development opportunities offered by the AFL in the form of the Oceania Cup and the chance for players to compete at the NAB Under 16 Championships in Australia. "Ït gives our local junior competition targets and incentives and motivates young players to aim for national selection so they can be spotted in the regional competions and win a spot on the Oceania and South Pacific teams. There is a clearer pathway which helps all adminstrators and coaches of local leagues in motivating our young players" Mathew Batsiua told us. The benefits of this pathway will no doubt be seen in the younger players now coming into the Chiefs squad. 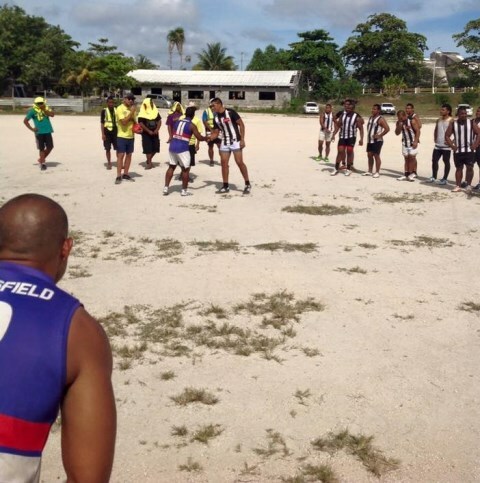 Auskick programs and women's matches have been a feature in recent times and can only continue to grow the strength of footy in the small island nation. Strengths must include the football preparation on home soil and team unity that has been built. The domestic competition is regular and hotly contested making them match hardened. The All-Stars tours should have given them a good warm up in Australian condition. Their weakness has been their inability to defeat the top nations and around stoppages they have sometimes been found out tactically by these sides. In 2008 Assistant Coach Wes Illig described the Nauruan players “all players stand out because of their low centre of gravity and the general carnage left behind them after they have hit the football. We will not have any 6 footers but as the ball is played on the ground 99% of the time height is not all it is cracked up to be and if you have 20 blokes having a go, leaving a physical trail of destruction behind them, teams tend to lose concentration of their game plans and structure”. Expect no different at IC17. Unfortunately Pilo and Johnny Dagiaro were late withdrawals due to other commitments. Ken Oppenheimer and Richmond Spanner are a tag team combination that has given nightmares to defenders in the AFL Nauru competition this year. Both strong targets up forwards, Oppenheimer perhaps better on the lead and Spanner in the air. Both know where the goals are and love to rack them up. Yoshi Harris - once an international scholarship listed player with AFL club GWS, Harris is an exciting utility that could be found anywhere on the ground, he has silky finishing skills. Will be pivotal in taking on whatever jobs are required of him to ensure a victory for the Chiefs. Eighth in 2002, fifth in 2008, sixth in 2011 and seventh in 2014. This time the Chiefs are a chance to make it a top 4 finish if they can pull it all together but there are no easy games at IC17. There is high anticipation and excitement across Nauru for the team to go far in the tournament this time. Last night Nauru played PNG in a practice match in Beenleigh (Qld) and went down by around 6 goals. Given that the two nations play each other in the tournament next week (Round 2) we might not take to much from that friendly hit out other than they were not on the winning side. Nauru play NZ in Round 1 which will be a big test first up if they can upset the Kiwis that boast a huge amount of talent experienced in Australian conditions then they may be primed for PNG. If not then they may be somewhat blunted going into Round 2. They play France in Kew and Canada at Royal Park in Rounds three and four, and while not easy matches would expect to win both these matches. If they can finish 3-1 in this new format, that would be a good result and if everything went their way 4-1 is not impossible. I don't think they can go all the way though. But they could also finish 3-2 which would be acceptable for most outsiders but very disappointing to the Aussie rules nation.